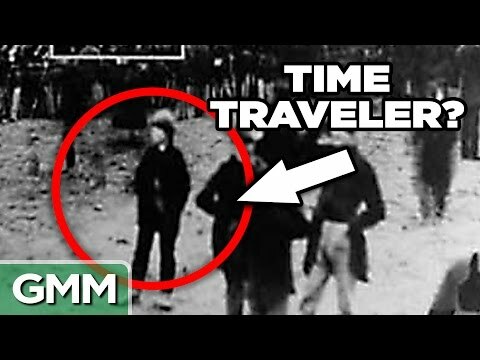 Are time travelers real? – Let’s talk about that. Good Mythical Morning! – Today is October 21st, 2015, the infamous destination day for Marty McFly and Doc Brown in – Back to the Future Part II. – Mm! Now, that movie was released in 1989, so their 26-year leap into the future is now – our present. – Whoa! And they delivered on a number of predictions including hoverboards, thumb print payment, drone cameras, video calling, and the wild popularity of – PewDiePie. – Oh ho! That’s not true. So, in the spirit of Marty McFly, the DeLorean, and the Flux Capacitor, we’re gonna be talking about some real life time travelers! Now, you may remember last year we did an episode called “4 Cases of Time Travel.” – I do. – Well, it turns out there are so many amazing cases and claims about time travel that that’s not enough to cover it! So we did a little boopity-boop-boop- badoop-boop-boop research and we got – some more for you. – Lemme hit you with this…open cockpit – biplane pilot from 1935, – Wow, that’s a mouthful. Sir Robert Victor Goddard, a pilot for the British Royal Air Force. When you got “Sir” in front of your name and you say you’ve traveled in time, listen. – Listen to that guy. – ‘Cause that means he’s like a knight, right? He’s been knighted. If you’re a “Sir,” right? Well, he was flying during the day, and it was a round trip flight. – Yep, the best. – And he’s going to Edinburgh and he looks down on his way and he sees the abandoned airfield in Drem, Scotland. – You’ve heard of it. – There it is, yeah. Everybody has. Nothing out of the ordinary here, you know? Dilapidated tarmac, four hangars in disrepair, pastures with some cows… but then, on his way back on the round trip, coming back through, he encounters some problems. He enters a downward spiral, almost dies, okay? But then he recovers and he finds himself flying in these strange yellow clouds, and then the clouds– You sure they weren’t yellow puddles on the inside of the cockpit? (chuckles) Could’ve been. And the clouds part and he looks down and lo and behold, there is the same Drem Airfield in Scotland, but now– – (dramatically) In the future! – It’s totally operational and renovated. It looks good as new. There are four planes down there painted yellow. Now, we all know that back then the RAF planes were not painted yellow. – Oh yeah. Who would’ve thought of that? – There was one monoplane down there which was unlike anything in the Royal Air Force in 1935. The mechanics’ overalls… you know, they were all working and bustling down there– they were all wearing blue overalls. You know they don’t wear blue overalls back then! – This guy’s got good vision. – They wear what? What color do they – wear back then, Rhett? – I dunno. – (whispers) Brown. – Brown! Brown! That’s right. Made it safely back, tells his friends, they don’t believe him. And then, four years later, 1939, guess what happened. They did reopen Drem Airfield, and what color did they paint the training planes? – Yellow. – Yellow! And they had one monoplane called “The Magister” just like the one he witnessed, was added to the fleet. And the mechanics’ overalls were changed to what color, Rhett? – Blue. – Blue! Was he on the planning committee for the new Air Force base? – (laughs) – I mean, there’s a way to confirm that your prediction comes true, just be on the board of directors. Do you know that – he wasn’t? – I don’t know. – And maybe he just has insight– – He was a “Sir.” into aviation fashion. I mean, I could totally see that going from brown to blue. – He wrote a book! – Seems innovative. In 1975, called “The Flight Towards Reality.” That’s good enough for me. I’m gonna read that! Okay, so that’s his story. I’ve got another story. – A little more recent. – Top that. Andrew Basiago. This guy’s a lawyer with five degrees. He’s also a writer and a member of Mensa. He also happens to be the first child to teleport! – Okay. – Through time. – Smart lawyer. – Okay. This guy has gone on Coast to Coast AM, this AM radio show that’s absolutely amazing. And they don’t just let anyone on that show. – No, they don’t. – (Rhett and crew laugh) And he’s told this entire story, so these are some tidbits from the story. – Okay. 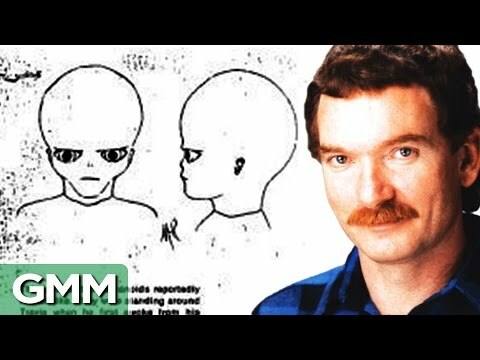 – So, he claims that back in 1968 when he was a boy, he was part of something called “Project Pegasus,” which is a supposed classified exploration of time travel and teleportation project sanctioned – by the US government. – So they would send kids on time travel – excursions? – Yeah! Yeah, because, you know, I guess the time machines are small. You gotta put youngsters in there. 140 of ’em supposedly involved in this. He claims, among a number of things, to have gone back to 1 million BC to check out the dinosaurs, where he was almost eaten alive. Either he was misquoted or… 1 million BC is not far enough for the dinosaurs. You gotta go– remember, like 65 million years is when – they went extinct, so… – Well, he was a kid. – Maybe he got his math mixed up. – Maybe. He went to 2045 to pick up some microfilm. That’s in the future. Doesn’t make a whole lot of sense to me, but… okay, anyway. As if that wasn’t believable, he says that because of his good performance in these duties, – Okay. – he was given the opportunity on November 19, 1863, to go back and see Lincoln deliver the Gettysburg Address. And there’s photographic evidence, everybody! – Bring it on! – Here’s the photo. This is what Andrew says, quote, “I am the boy standing in the center of the image looking to his right. My shoes were lost in the transit through the Quantum Plenum that took me from the plasma confinement chamber. A cobbler–” that’s a shoemaker, not a peach cobbler that you would enjoy– “by the name of John Lawrence Burns furnished me with a pair of men’s street shoes and a Union winter parka. In this image, you can see how oversized the shoes were. When I walked over to this location and stood in this manner to detract attention from my shoes–” This is how I always stand when I wanna detract attention from my big shoes. – (Link laughs) – (Rhett) I just kinda look to the right and point both of ’em in the same direction. – (laughs) – “Lincoln had not yet arrived and I only stood in this position for several minutes before the quantum field effect produced by the plasma confinement chamber ended and I found myself back in the Time Lab in New Jersey!” So he didn’t get to see the Gettysburg Address! What a bummer! – But he got some sweet new kicks! – Yeah he did. – (crew laughs) – A little oversized, but you know, you can just stand sideways and nobody’ll notice. – So the proof is right there! – So, this is photographic evidence. – Proof is in the shoes. – And this guy’s made quite a stir – on the radio circuit, Link! – Has he, now? He has. So there’s that. You got another one? Well, is there any other pictures of the shoes? Because I’m really into that. Nope, but I could do, like, a CSI zoom-in on ’em though. On November 2nd, in the year 2000, a user by the name of “Timetravel_0” began a thread on the Time Travel Institute Forum’s web site and claimed that he was – from the year 2036. – Mmhm. And he was like, “I’ll answer any questions you got.” – (laughs) Here I am at the forum. – I’m a time traveler and here are my – office hours. Um, so– – This is the place to go if you come back from the future, though. The Time Travel Institute forums. – Right. – I mean… don’t go to the press. Quickly, some of the things you gather are: he was an American soldier from the year 2036 based in Hillsboro County, Florida, and his name was John Titor. He started traveling in time as part of an undercover secret government project where he had to return to the year 1975 and retrieve an IBM 5100 computer – Of course! – and bring it back to 2036. But instead of just going back to the future, he stopped in the year 2000 for, quote– Hold on. Why was he getting a computer from 1975 to solve a problem in the future? To debug the Unix Year 2038 problem, which is– – Oh! Oh, okay. Continue. – (Rhett and crew laugh) – It’s like Y2K but in 2038. – Yeah, gotta have those 1975 computers. Instead of going back to the future, he stopped in the year 2000 for, quote, – “some personal reasons.” – That was a good year! As he’s answering all these questions in the forum, he’s giving all types of details. You can read all this stuff. It’s really fascinating. He explained time travel, he said he travels using a Displacement Unit that was made by General Electric. He’s very forthright. He scanned user manuals. – He had a brand integration in his story. – (laughs) – GE! – (both laugh) Yeah. And he showed pictures of equipment and he had taken those photos with – Polaroid cameras. – Yeah. He’s into retro stuff. – (laughs) – He goes back to 1975, he only takes – Polaroids… I like this guy. – So, the situation is, you know, if in 2036, this guy was in the military, then, if you look at the range of time, – well, right now in 2015– – He’s alive right now. ‘Cause they’re not gonna send, like, an 18-year-old on this mission. Well, if they did, he could be about to be born, or he could be in grade school. – No, Link, he’s alive. – Most likely. You can’t be but at least 30 years old to go on a mission like this, so 30 years old in 2036, he’s like 9 years old right now. This is a 9-year-old! John! – And he’s going to be a time traveler. – Well, we should have him on the show. – Right. Or his mom. Or both. – Or both! You can both come. If you don’t travel by yourself, come with your mom. I don’t care. Now, his mom went on Coast to Coast and, speaking through a lawyer, because she actually wouldn’t talk, the lawyer was trying to support her case of being John’s mother, and that didn’t really amount to much. But I think we can get to the bottom of it, especially, John, if you reach out to us. Bring your Polaroids, bring your mom, and bring a 1975 computer. We’ve got a NASCAR – computer we can trade. – John predicted that a world war in 2015 – would kill 3 billion people, so… – Oh, there’s still some time left. There’s some other predictions I can go through in Good Mythical More, but for now, I’m pretty excited about the cases for time travel! – (laughs) – Let us know what you think in the – comments. – Thanks for liking and commenting and – subscribing. – You know what time it is. – Hi, I’m Avery. – Hi, I’m Shea. – Hi, I’m Sophie. – Hi, I’m Liv. Hi, I’m Ava, and it’s my birthday. (all) And it’s time to spin the Wheel of Mythicality! Woooooo! Today is the last day that you can get the hoverboard shirt! You have to act – (both) now! – to get that shirt, people! – (Rhett) RhettandLink.com/store. – Click through to Good Mythical More. We are gonna play Guess that Celebrity Time Traveler Game. (high pitched) Ooh, it’s gonna be so fun! Rhett’s got some pictures of celebrities in the past. (Rhett) Unisong about beepers. – ♪ (both) Beep, beep, beep, beep, beep ♪ – ♪ What’s that sound… ♪ – ♪ coming from my pocket ♪ – (both) ♪ it’s a beeper ♪ ♪ (both) Beep, beep, beep! What’s that sound coming from my belt loop? ♪ – ♪ It’s my beeper! Beep, beep, beep ♪ – ♪ Let me take you to the future ♪ – ♪ But not really ♪ – (crew laughs) – ♪ (both) Take me to the future ♪ – ♪ Gonna meet John Teeter ♪ – (laughs) – Titor. I said “Teeter.” .